Tron 2.0 takes the cult-classic 1982 film forward two decades and extends the movie’s visionary ideas forward to a modern vision of cyberspace. Consisting of both first-person disc battles and light-cycle races, the game will feature more than 30 single and multiplayer levels. Tron 2.0 will build on the movie’s distinct style with an updated look featuring brand new light-cycles designed by Syd Mead. Join us as we preview this exciting release and find out why fans of the film and PC gamers are so excited. 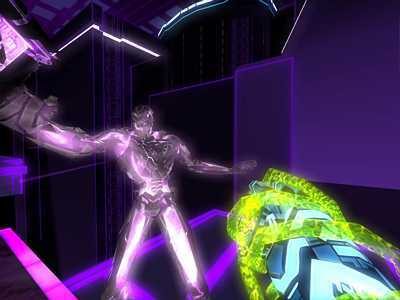 Disney’s classic computer animation landmark Tron was a landmark film that explored the cutting-edge of computer graphics and theories about cyberspace. While it went over the heads of many people when it was released two decades ago , its reputation has only increased through the years. The film’s visionary design and forward-looking plot have proven to be ahead of their time. While it didn’t do that great at the box-office initially, the 20th anniversary release of the film in a deluxe DVD was well-received. Now, developers Monolith have collaborated with the folks at Disney to further the Tron renaissance on PC’s everywhere with the release of their highly-anticipated Tron 2.0 coming later this year. Taking place two decades after the film, Tron 2.0 follows the adventures of Jet Bradley, the son of legendary programmer Alan Bradley. A malicious Internet company has taken over Encom. The fiendish CEO has focused Alan’s research into human digitizing technology that was lost at the end of the film when the MCP was destroyed. Their plan is to use this technology to take over the world of cyberspace with digital terrorists. After his father disappears, the son’s job is to locate his father, and is zapped into the computer by his father’s sophisticated AI program, Ma3a. Once inside, instead of facing off with the evil MCP and his minions, Jet will be up against the Internet company’s Avatars and other bad guys. Disney is promising more than 30 intense single player modes, plus multiplayer disc and light-cycle modes. It won’t be all action, because in addition to disc-combat, Jet will also be puzzles, where you need to unlock secret codes to pass through firewalls. This will also allow the game’s storyline to propel the action, not the other way around. When it comes to the combat system, Tron 2.0 is taking a unique approach. Unlike other FPS titles, enemies won’t die instead, they’re de-rezzed and deleted from the system. Players will also use the famous discs from the movie to attack enemies, as one of four primitives. In addition to the game disc, the other weapons include a Rod Mesh and Ball. Each of the weapons is quite powerful but can be enhanced using a system of subroutines or power-ups to make them even more powerful. As in the original movies, the good guys will wear the blue suits while the enemies are red, however, they’ll be more built and realistic this time around. While the in-game disc-combat is exciting enough, Tron 2.0 will also feature an exciting multiplayer element. There will be 5 different multiplayer disc combat maps, each containing four arenas. In this mode, up to 16 players can compete individually or on teams. This is a cool feature that should further the game’s longevity and ties in to the film’s concept of users competing in cyberspace through their programs perfectly. Tron 2.0 will allow the player to gain many different types of objects along the way including disc upgrades, additional weapons and more at substations located throughout the Grid. Jet can also contact the outside would and get advice and upgrades subroutines from the all-powerful users. Unfortunately, this isn’t going to be a cakewalk as there will several different types of enemies in the game who will try to destroy Jet. Some of these will be other programs and others will be deadly computer viruses. The game will feature many different levels and will take you through both familiar locations as well as new ones. You’ll see many of the old areas, but now they’ve been ‘built’ over with new elements layered on top of the old ones. In addition, they’ll be many contemporary locations including Lab Servers, Personal Computers, Power Routers, Ancient Mainframes, Internet Hubs, Infected Servers, PDAs, Databases and Firewalls to name few of the new areas you’ll be able to explore. 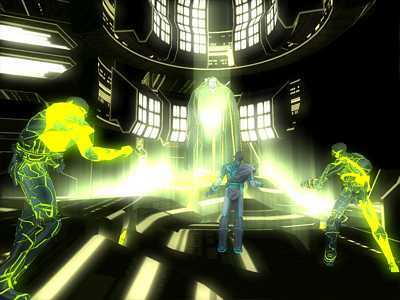 Another aspect of the game that should excite players are the light-cycle modes which support both single and multiplayer action. The original Light Cycles are slated to return, but will also feature new cycles designed by legendary designer Syd These light cycle sequences will recreate some of the most exciting scenes from Tron. What’s really cool about the Light Cycles is that they can do more than just race around the arenas and have some new features and gadgets to make the light-cycle races more exciting. By using a Lan or an Internet connection, up to 8 players can compete individually or on a team in four different Game Grid Arenas. Players can use either first- or third-person views as they race and try and knock their opponents out. In this mode, the goal is to make your opponents run into obstacles, walls and, the light cycle trails you leave behind. In the light-cycle mode, players can also run over and collect a variety of power-ups, including the shields, missiles, boosts, trail spikes, turbo curse, grab, trail reset, force use, trail extenders, and more in order to keep their opponents on their toes. While the multiplayer modes sound exciting, TRON 2.0 will also include an extensive single-player light cycle game. 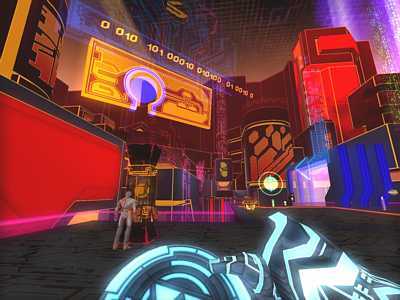 Single player mode allows you to race in 4 different levels, the game will allow players to compete against game bots in 16 light cycle circuits. If you successfully complete two circuits, you’ll unlock power-ups, as well as different light cycle types and colors, plus more racing circuits. While you’ll face a lot of foes, benevolent programs will also be found in Tron 2.0 These NPC’s will aid the player by giving them new subroutines, though Jet will only be able to use a limited number of these at a time. One of the coolest aspects of Tron 2.0 is its character-augmenting subroutine system. This will allow you to use a varierty of objects including weapons, shields, gadgets and modifiers. These Subroutines will allow you enhance the characters offensive and defensive abilities, plus carry items and acts as Tron 2.0’s inventory system. Along the way players will also be able to play on the game grid with the cool light-cycles. Mead. In addition, many of the film’s locations will be retrofitted with new architecture and style on top. Aesthetically, Tron 2.0 will be true to the stark, computer-generated look of the original film in some areas but Monolith is promising to implement several areas that build upon the original look while incorporating advancements in computer graphics. For example, while you’ll see areas that resemble the original film, they’ve been embedded underneath the new elements to create a futuristic environment that shows how the world of Tron has evolved. The game will also use the LithTech engine which, judging by the screenshots, looks to deliver a very solid game. Additionally, Monolith is promising to recreate the “circuit halos” look of the original film by using a unique glow effect has been implemented around the various objects. This will make the computer environments seem almost alive while giving Tron 2.0 a unique look unlike anything else currently on the market. 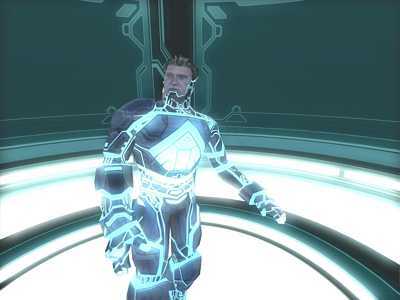 Tron 2.0 continues the storyline of the original films, and to further enhance the continuity, Bruce Boxlietner and Cindy Morgan will lend their voices to the game. They’ll reprise their roles as Tron and Yori from the film. These Tron veterans will be joined by Rebecca Romijn-Stamos. Ms Stamos is cast as a championship Light Cycle pilot named Mercury who doubles as a Game Bot in the new game. While its not certain, Wendy Carlos’ score was such a signature part of the film, we’re hoping to hear at least a few bars in the game as well. Since its initial announcement last year, Tron 2.0 has built up quite a buzz amongst gamers. With an updated storyline, and a visual style that stays true to the original, this PC sequel should please fans of the original. The multiplayer modes also sound like a lot of fun, allowing many gamers to actually feel like they’ve been transported inside the cyberspace world first visited two decades ago. While it could have been a nostalgia trip, there should be more than enough contemporary elements to keep the ideas fresh enough to appeal to the current generation of gamers. This is definitely one of the most exciting and innovative movie tie-ins in recent years, staying true to the original vision while building on its brilliant ideas. Tron 2.0 looks to offer one of the most unique experiences on the PC this year, and gamers who loved the film will have a lot to look forward to.